REVEALED: TB Joshua's Uncanny Influence In Tanzania!!! Within hours of Pastor T.B. Joshua touching down in Tanzania on Tuesday November 3rd 2015, he had met the three most important political figures in the country - John Magufuli, the President-Elect, Jakaya Kikwete, the outgoing President and Edward Lowassa, the former Prime Minister and opposition leader. However, a government source has revealed that the Nigerian Pastor's uncanny influence in the East African nation did not just begin during the recently held elections. "Our new President, John Magufuli, visited T.B. Joshua in Nigeria long before he even nursed a presidential ambition," explained Eng. Ngimbwa, chairperson of the Tanzanian Contractors Registration Board. As Tanzania's industrious Minister of Works, Magufuli visited The Synagogue, Church Of All Nations (SCOAN) in Lagos, Nigeria with his family in 2011, evidenced by a picture which surfaced on social media showing the Tanzanian politician holding hands with Joshua in the cleric's office. He has since remained a staunch supporter of the Nigerian and partner to Joshua's popular television station Emmanuel TV. Magufuli's emergence as the presidential candidate for Tanzania's ruling party CCM was a surprise to both local and international observers, given the more prominent and popular figures he ran against. "It was T.B. Joshua that actually encouraged him to contest for presidency," Ngimbwa insisted. "When he won the nomination against all odds, we knew it was God at work." Intriguingly, Lowassa is also an outspoken supporter of Joshua, having visited Nigeria to meet the ‘prophet' on several occasions. A photo of the former Prime Minister attending one of Joshua's services in 2012 was widely circulated in Tanzania. Lowassa's opposition CHADEMA party have insisted the election was won on fraudulent grounds, refusing to accept the electoral announcement of Magufuli's victory. "If there's anyone who can bring peace to the warring politicians at this time, its Pastor Joshua," one Tanzanian blogger wrote while sharing the story of the cleric's arrival, which saw the President-Elect waiting to meet him at the airport. A tweet from Magufuli's official Twitter account acknowledged that Joshua will be in Tanzania for the presidential inauguration on Thursday 5th November 2015 although it is unclear if he will play any role in the ceremony. "T.B. Joshua's visit to Tanzania can only be a blessing to our nation," wrote Geoffrey Kapuliya, a Tanzanian pastor, on Facebook. 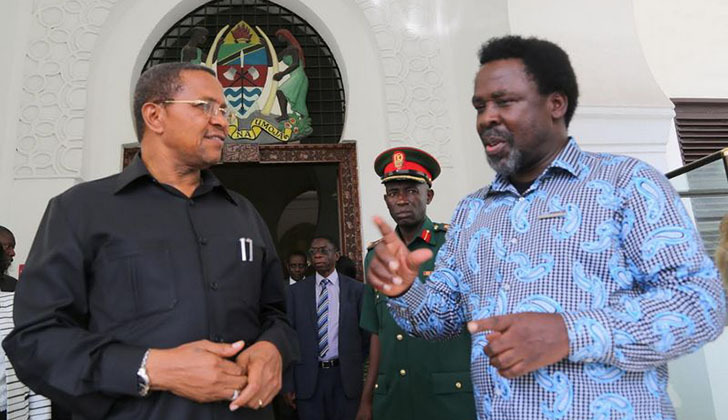 A video on YouTube shows outgoing Tanzanian President Jakaya Kikwete escorting Joshua around the Tanzanian State House and introducing him to the country's ministers. The late Ghanaian President John Atta-Mills described himself as ‘a member' of The SCOAN and publicly testified that Joshua ‘prophesied' his ascension to power. Similarly, Zimbabwean Prime Minister Morgan Tsvangarai visited Joshua's church in Nigeria on several occasions as did former Malawian President Joyce Banda and late Zambian President Frederick Chiluba. Joshua allegedly played a role in the successful transition of power in Nigeria's recent election. He claimed to have told outgoing President Goodluck Jonathan that his ‘regime had come to an end', advising him to peacefully concede power.